If you've been learning a language for more than a minute, you know that there are thousands of apps wanting your attention, brain, and support. But which ones are worth it? What are the hottest, latest super tools? In this episode of the Creative Language Learning Podcast, we've got your answer! In the intro to the show, we discussed how our husbands learn languages and how travel and meeting people never get old in language learning. Bilingual lyrics, Spanglish and Justin Bieber of all people winning a Latin grammy. Lindsay brings up the Despacito Effect and we discuss if that's a thing. What ARE the requirements for making a song a "Latin" song - an artist from Latin America, a song in Galician, an American band singing in Portuguese...which of these is eligible? If you love music, check out our pop music episode too. This episode is also time for our seasonal list of top tools to help you learn a language. In our show, we nominate three great tools each and select our winner - listen in to find out the must-have for you this season. 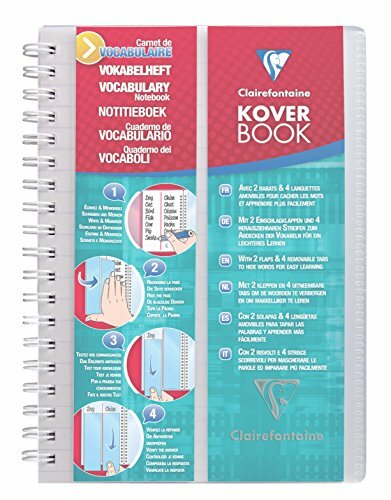 This is a classic notebook for learning and testing yourself on vocabulary. Write down your words, and use the handy cover tabs for testing yourself. Perfect for one of my favourite vocabulary learning techniques of all time, Write-Look-Cover-Repeat. Libby is a library app designed to give you access to ebooks and audiobooks in your local library's catalogue. So that means you can borrow hundreds of books and even language courses right now, for free, on your phone or tablet. Available for iOS, Android, and Windows 10. After hearing so much high praise for Lingq from Shannon Kennedy on episode 65 of the show, Lingq got a well-deserved new mention. This app is designed to help you read any text in another language, and it remembers the words you study. Check it out as it might plug your gap. This app takes words that you've looked up on google translate and automatically creates flashcards of them. It's out for Android and iOS, and will "proper plug the gap" if you're stuck on how to study all those new words you've looked up, for example during and after speaking practice. Discover a museum near you and check out their leaflets in other languages. Perhaps there's even a walking tour so you can get reading and listening practice at the same time, and play around with the available languages. This app is for Spanish users, and gives you access to a huge library of online videos from cartoons to TED talks. You will be able to listen to the video and see the subtitles, and it even pairs with Duolingo. Great for Spanish learners who want to add more video to their routine. This app is out for Android and iOS. Listen to find out our TOP 3 recommended as a can't-miss for winter 2018.